And for our newest class here at Dartmouth, another reason for confusion could be the fact that the freshman frat ban was just lifted, and it’s unclear whether or not wearing a costume to a frat basement is a wise move. Whether you’ve had an elaborate costume planned for months or are still deciding if overnight-shipping a pair of black cat ears is worth it, there’s a lot to be learned from Halloween’s history here at Dartmouth. This week, the Mirror looked through archives of The Dartmouth to find out how the holiday was observed back then, and how those celebrations can inform this year’s special, spooky day. Halloween’s roots aren’t entirely known for certain, but one thing is certain: the holiday has been around for a long time. The holiday has been around at Dartmouth for a long time, too, and as early as 1896, students were complaining in The Dartmouth that “the decadence of the old-fashioned Hallowe’en party” was something that students either regretted or forgot about entirely, not unlike many parties today. Fast-forward to 1988, and the observance of Halloween was much closer to how we know it today. In one opinion column published on October 26, 1988 titled “How to Scare with Flair,” Pier Kooistra ’89 described how, while Halloween was a fun time, the holiday’s black and orange color scheme left him a little disappointed for one key reason. “But, alas, the excitement and electricity, which should belong to Halloween, are somehow dulled by the holiday’s traditional Princetonian color scheme,” he wrote. Some things never change, huh? This year, to avoid a Halloween reminiscent of other Ivy League schools, feel free to dress up in an iconic Dartmouth costume! Your options include scavenging for pine needles in the local wilderness to pull off the ultimate Lone Pine costume, finding a (registered) keg and dressing up as Dartmouth’s favorite unofficial mascot, Keggy, or simply wearing every green article of clothing you own and going as the Big Green! Green is just as much a Halloween color as black and orange, and this year is the year to go all out. 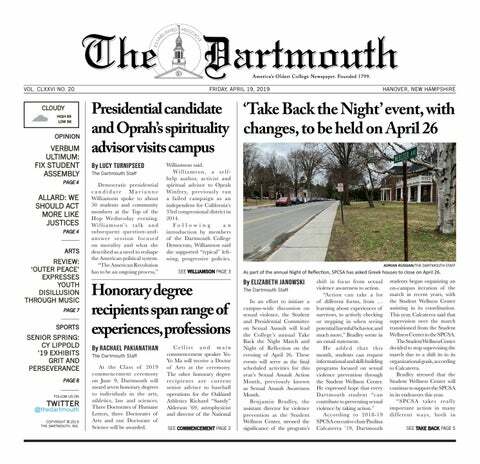 To a modern-day audience, the idea might seem silly, but an article in The Dartmouth titled “Haunted rumor spooks colleges” noted that over 70 women at the University of Massachusetts had contacted campus police with safety concerns. Students at other colleges, like Mt. Holyoke College, were also concerned. Here at Dartmouth, however, students seemed largely nonchalant about the rumor. In the same article, the author considered which residence halls were most at-risk according to the psychic’s prophecy. Apparently, the prophecy mentioned that the massacre might happen near a river, so naturally the River Cluster was in danger. There was also, for some reason, a fear that the killings would happen in an L-shaped dorm, so Gile Hall was another possible crime site. As it turns out, the rumor was just that, and there were thankfully no massacres on campus. However, since there’s always a miniscule chance that the prophecy was mostly correct and just got the year wrong, make sure to play it safe this year. Again, it’s probably a good idea to avoid the River Cluster — even if there’s no danger, it’s just not always the most fun place to spend the night — and be sure to avoid any L-shaped bars in fraternity basements if you choose to go out. In 1992, The Dartmouth published a Halloween feature titled “Halloween provides fun options,” which mentioned some of the traditions taking place on campus, such as the annual Halloween party at Alpha Theta, to which students wore “original costumes,” and a mass migration to Cambridge for “Harvard weekend,” which happened to overlap. There were some traditions, however, that the authors didn’t look as favorably upon. “From afternoon ‘tea’ at Bones Gate to generic decorations at Thayer Dining Hall, Halloween at Dartmouth offers more than the traditional,” they wrote. There will always be some parties that go better than others, but why not ditch the party scene altogether? Trick-or-treating has been and continues to be an option for the younger members of the community, but students are certainly welcome to give it a try as well. You’ll have to figure for yourself which houses give out the best candy, though throughout the years, people have been willing to share their best trick-or-treating tips. For example: maybe don’t show up unexpected to your professor’s house demanding king-size chocolate bars. In more recent years, Halloween at Dartmouth has consisted of both student celebrations and community service in the Upper Valley region. According to the 1994 article “Halloween treats students to nights of tricks,” an Undergraduate Advisor in the Choates organized a trick-or-treating event for professors’ children, and another student was quoted saying that he had worn a costume to cheer up patients at Dartmouth-Hitchcock Medical Center’s psychiatric ward. Today, there are plenty of opportunities to support the greater Dartmouth and Upper Valley communities while still getting into the spirit of Halloween. Of course, there are the obvious ways to give back, like sponsoring a community haunted house or collecting donations for your favorite charity — but what are some lesser-known strategies? Here’s one: Try wearing your most ridiculous costume to your favorite restaurant and give an extra big tip when the waiter manages to keep a straight face. Finally, there’s the topic of what to wear in the first place. Dartmouth students across the years have struggled with the last-minute costume dilemma, and while there’s no single best costume, there are some tried and true tips. In the October 2001 article “Halloween at Dartmouth: Costumes, Candy and Cocktails All Around,” several students shared their best Halloween costume stories. Jeff Kinkaid ’01, for example, wore the same clothes he normally wore to represent “the masks that hide our true selves.” The friend of another source, who was referred to only as “Tony from DDS,” wore an elaborate witch costume and ended up losing a shoe while cruising around campus on the hood of a Jeep Wrangler. A third student didn’t describe his own costume, but instead a bizarre costume he had seen the year before. That said, it seems that the most memorable Halloween costumes, then, are the most creative ones, and creativity can only come from within. Remember, thinking of a good Halloween costume should be a piece of cake after all the midterms you’ve inevitably survived this term. This Halloween, make sure to have fun and stay safe, and remember that whatever wild stories come out of tonight are nothing compared to the tales of Dartmouth Halloweens past.